A Windsor and Maidenhead funeral director swapped funeral attire for a tracksuit and safety harness to take a charitable plunge. 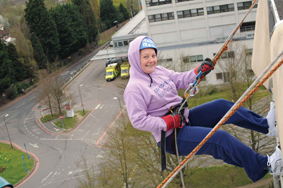 Tara McKay from The Co-operative Funeralcare in Dedworth Road, Windsor and High Street, Maidenhead, abseiled 100ft from the top of the John Radcliffe Hospital in Oxford, raising over £400 for the Neuro Intensive Care Ward in the process. Tara travelled 30 miles to attempt her charity feat for very personal reasons. “My partner, Lee, was critically ill last year, following an error in a routine operation,” she explained. “He was transferred to the Neuro Intensive Care Ward where he spent three months.” Lee accompanied Tara for the abseil.